Another day, another ransomware. The latest is now Satana and according to an article in PC World - attackers are developing an aggressive new ransomware program for Windows machines that encrypts user files as well as the computer's master boot record (MBR), leaving devices unable to load the OS. The bootlocker will display immediately before Windows starts and require a password before the victim can start Windows. 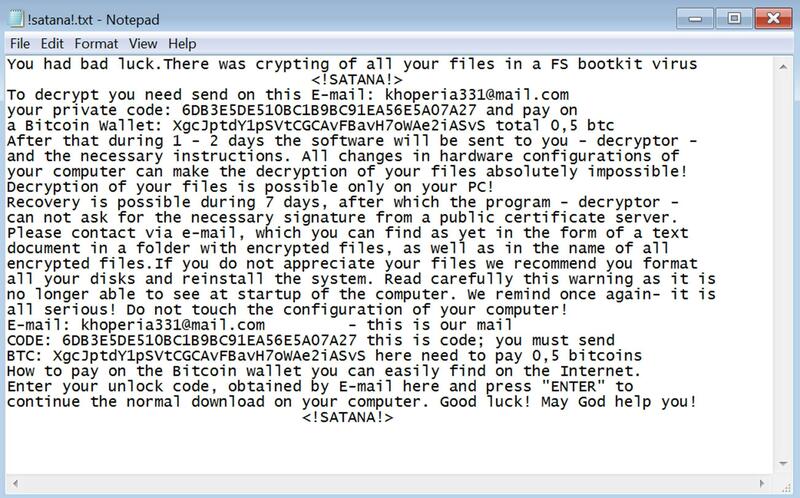 The Satana Ransomware requires bitcoins in order to get the decryption key. how can you stop Satana before it stops you? With SECDO, the Satana ransomware is detected and blocked before your files are encrypted and the user is locked out of their machine. Here is the alert the security team would receive if Satana made its way into the organization. SECDO also provides the security team with a visualization to see the chain of the events running from the root cause to the problem symptoms. Protect your organization from Satana and other versions of ransomware with SECDO's anti-ransomware solution - learn more about it.